Metal detecting has recovered a range of finds dating from the Iron Age to the post medieval period. These include Roman brooches, medieval belt fittings and a medieval buckle. 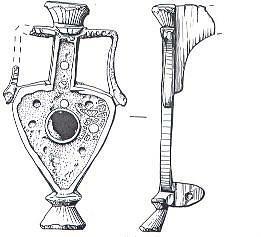 One Roman brooch is in the shape of a flagon. Iron Age, Roman and medieval coins and medieval and post medieval jettons have also been found. Roman and medieval coins, medieval and post medieval jettons, post medieval token. A. Rogerson (NLA) 2 November 1995. September 1995. Metal detecting finds. A. Rogerson (NLA) 30 October 1995. August 1996. Metal detecting find. Iron Age coin found at . A. Rogerson (NLA) 30 September 1996. One early post medieval coin. --- Photograph: 1995. LCM 17-18, Romano British brooch..
<S1> Illustration: White, S.. 1995. Drawing of a Roman brooch. Paper. 2:1.